Across much of the Pacific coast, where the snakes and the newts encounter each other, garter snakes’ resistance to tetrodotoxin tracks or exceeds the quantity of poison found in the skin of local newts. We’ve generally understood this to suggest an arms race, with complications — some cost to the production of tetrodotoxin, or some additional source of selection on the trait, that counterbalances selection from snake predation to create situations in which the newts produce less toxin than the snakes can tolerate. 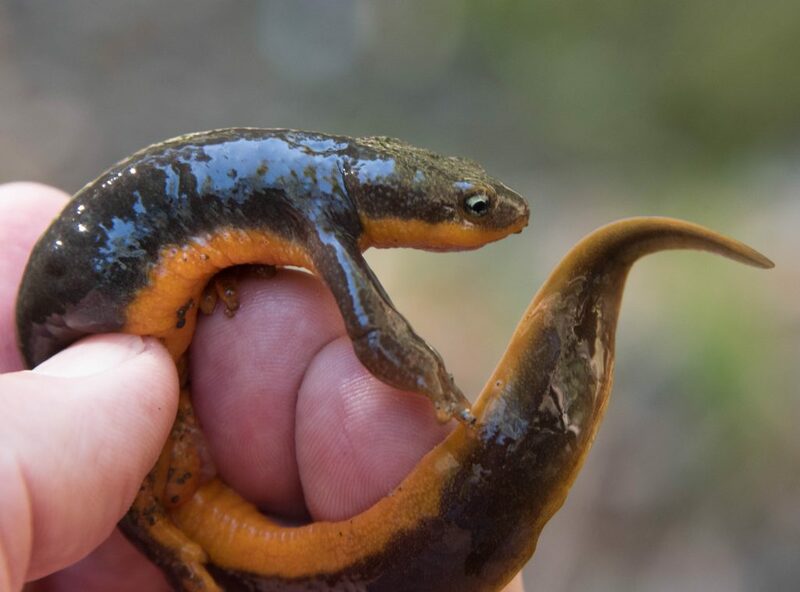 Newts have other predators besides garter snakes, and although snakes’ tetrodotoxin resistance is understood down to the molecular level, the physiology behind the poison’s production is still something of a mystery. Hague et al. tackle the question of snake-newt coevolution with a population genetic dataset from a transect of sites from the Olympic Peninsula down the Oregon coast, along which toxin production and tolerance are well matched. They sequenced the garter snake gene for the molecular channel targeted by tetrodotoxin to track the frequency of resistant variants, and used ddRADseq to generate genome-wide SNP datasets to describe the population structure of both snakes and newts. The dataset recapitulates the phenotype matching result seen in this region — snake populations that coexist with more toxic newts have higher frequencies of resistance mutations. Snakes’ quantitative resistance to tetrodotoxin generally tracks the frequency of resistance mutations, which makes sense. 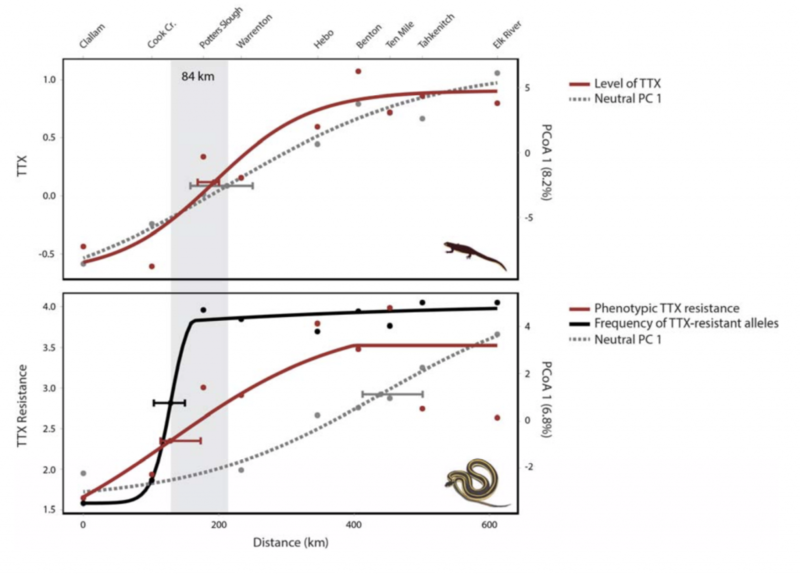 However, the results for predator and prey diverge when the authors add population structure to the comparison: newts’ production of tetrodotoxin closely tracks their overall population structure; while snakes’ resistance does not align with the snakes’ population structure. The authors performed a formal cline analysis with their phenotypic and genetic data, which identified clinal centers for newt toxin production, newt population structure, snake toxin resistance, and snake resistance allele frequencies within a few dozen kilometers of each other; but the clinal center for snake population structure lies hundreds of kilometers to the south. Hague et al. interpret this to mean that snakes’ tetrodotoxin resistance is under selection created by the newts, but the newts’ tetrodotoxin production is shaped not by selection from snakes, but by the demographic forces described by the population genetic data. For the region they’re sampling, then, that would mean the two species are It’s a sign of selection if a gene shows a spatial pattern of variation at odds with overall population structure, which reinforces the conclusion drawn from the original matching with newt phenotypes. The opposite pattern, then — the one seen in the newts — is consistent with a lack of spatially varying selection, or selection strong enough to overcome the homogenizing effect of migration among populations. That would mean the snakes are under selection by their deadly prey, but don’t manage to exert reciprocal selection on the prey’s toxicity, so the two species aren’t coevolving. So there is, as we so often say, a lot to learn from future data collection, and possibly more analysis of the current data — this is, after all, a preprint rather than a peer-reviewed paper. In the meantime, we might have to rethink how we frame the snake-newt interaction in undergraduate biology courses. Even if it’s not a textbook example of coevolution, it’s still a fascinating case study in the evolutionary outcomes of predator-prey interactions. This entry was posted in Coevolution, natural history, population genetics, selection and tagged Taricha granulosa, Thamnophis sirtalis. Bookmark the permalink.